November | 2015 | Love Those "Hands at Home"
I am in the mood to give something away. I’ve been thinking about it for a while but I wasn’t sure what to give. Then I was ironing pretty vintage kitchen towels and I thought, “Hey, I know! A pretty vintage kitchen towel!” Because I’m sure you all share my dishtowel jones, right? It’s vintage. I wouldn’t want you to settle for anything less than vintage. It’s pretty. Fresh and unusual colors on a bright white background, all in crisp linen. Yum. It’s unused and clean. Because I wouldn’t want to send you a towel you might consider icky. It has flowers, for the gardeners, and tulips and daffodils, for those experiencing spring and those already longing for it. And the flowers are turquoise because, even though turquoise flowers are rare or non-existent in nature, they shouldn’t be! It’s an all-around perfect towel! I hope you think so, too! To get a chance to win the towel, you can encourage me to do a chore I’ve been avoiding. I need to find out how many of these yo-yos I’ve made so far. I’ve been avoiding this chore because I have a notion of how many yo-yos I will need for even a twin-bed-sized coverlet and I am loathe to acknowledge how far I have to go. I just haven’t been able to bring myself to count them. So, I’m asking you to guess how many yo-yos I have in this pile and jar. In a week, after you’ve had a chance to guess, I will HAVE to count them so I know who to send the towel to! I’ll accept guesses, in the comments here, until noon, my time, on December 6. Anyone, in any country, can guess. This towel is willing to travel! Only one guess per person. In the case of correct ties, I will do a random draw of those who made the correct guesses. If no one guesses correctly, I’ll send the towel to the person with the closest guess. Please make your guess and encourage others to guess, too–this towel needs an excellent home! And I need to get busy making more yo-yos . . .
Get out your grandmother’s tablecloth and napkins, folks! And remember the good times . . . These days are hectic. Not bad-hectic; in fact, they are quite pleasant-hectic. But hectic and busy and stressful nonetheless. Most evenings provide me with a respite, however–an hour or two of quiet time, when I indulge in an adult beverage and some simple, soothing hand sewing. It’s a homely sort of ritual—a fire in the fireplace, a cat or two snoring nearby, a husband strumming the guitar, and the sewing. This time would not be restful, though, if I had to go searching for my needle, dig around for my thread, and then wonder where, exactly, I left my scissors. So one of my favorite tools is a tool that holds my hand sewing tools. This small sewing caddy was handmade locally, by the husband of the woman who owns a local quilt shop. It is aesthetically appealing in its own right but its value comes from the tidy way it corrals my basic needs. The thread holder can be configured to hold the spool vertically or horizontally, according to what suits me. My small scissors fit neatly into the slot on the end. My favorite mechanical pencil and thimble have their places. And a super-strong magnet is set into one end—I just need to fling my needle somewhere close to that magnet for it to be snagged. So, when I turn my back on candy making for the day or finish the deep cleaning that the upcoming holidays necessitate, when I come home from running errands and turn off my computer for the day, my quiet place is ready and waiting. It’s easy. I pick up fabric circles and my yoyo gizmo, reach for my sewing caddy, and settle in to my respite. Ahhhh . . . .
Do you have a tool that makes relaxing more relaxing for you? So . . . Maine. Crashing ocean waves. Rocky shore. Pine trees. Mountains. Autumn color. That’s all very nice, I hear you cry, but what about the important stuff? In truth, I am not a shopper. My usual stance is that if I can’t buy it from the LL Bean catalog, I don’t need it. And, of course, LL Bean’s flagship store is in Freeport, Maine, and yes, we did go there. But of the gazillion other retail and outlet stores in that area, we bothered with only one and then we got out of there as fast as we could. But that doesn’t mean we stopped shopping. Oh, no, not at all. Within 60 miles of each other, along Route 1 in Maine, two shops make the hearts of weavers, and all enthusiasts of fibers and textiles and beautiful American crafts, sing. These two shops, Swans Island Company and Halcyon Yarns, are very different and both well worth a stop. Swans Island, in Northport, is a place to go to feast your eyes on exquisitely hand-crafted textiles made the old-fashioned way. It’s a place to go to appreciate that some people still dream of living in a small community and engaging their fellows in traditional work, sharing values of doing the work by hand, doing it exceedingly well, and doing it together. The company now offers other items in addition to their blankets, including their yarn so the rest of us can enjoy it in our own creations. The shop is serene and spare, the textiles are simply displayed, and the quality and authenticity of the work is undeniable. I could live there. Halcyon Yarns, in Bath, caters to all of us who make things from fibers. Spinners? Yup. Crocheters? You bet. Felters? Uh huh. Knitters? Got you covered. Weavers? Yes, yes, yes!!! We’ve purchased yarn from Halcyon’s website and catalog but there’s nothing like going to the store and wandering the aisles. The feel is sort of like an old general store, with not a lot of attention paid to fancy displays. The floor and shelves are bare wood and there’s lots of stuff just sitting around on the floor. But there is beauty and inspiration everywhere you look! Walk in the door! Look up! Look down! Walk around a dozen times and see something new with every pass. It’s actually pretty overwhelming. As usual, all ideas of actual items I might want to weave flew from my head and I spent an hour wandering around with a cone of black cotton thread. My eyes were dazzled and my mind was boggled. What you see . . . Eventually, of course, I chose some yarns, almost at random, thinking that since they were all pretty they could certainly be turned into something pretty. The ones I chose and the ones my husband chose have been added to the pile of yarns we bought on our previous weavers’ road trip to Maurice Brassard. The pile is getting a little embarrassing, truth be told. But we also bought a new book, full of tempting project ideas, and we have a long North Country winter ahead. We have plenty of time and inspiration to help us use up that stash of yarn. And we have no weavers’ road trips planned in the future. Oh, except that one in April . . . If you can’t make your own road trip to Maine, both Halcyon and Swans Island have good websites and I know from my own experience that Halcyon has excellent customer service. It could’ve been a disaster, a birthday to remember for all the wrong reasons. A trip to the northeast corner of the United States at the end of October could’ve been all about cold rain (or snow! ), gray skies, closed shops and restaurants, and desolate landscapes. But, through a combination of decent planning and excellent fortune, our trip to Maine turned out to be memorable for all the right reasons. To me, the most important part of planning is to mine own self be true. We know ourselves well enough to know that crowds (too much people!) and shopping and go-go-go aren’t fun for us. So we planned a trip that matched our temperaments. The island shore is mostly rocky—I love a rocky shore better than most anything. But for those who prefer a sandy beach, the park provides one perfectly perfect Sand Beach. 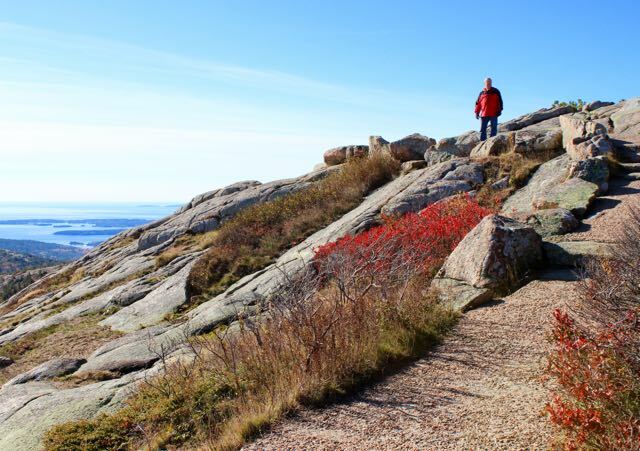 And Acadia also provides a new candidate for world’s most perfect mountain. 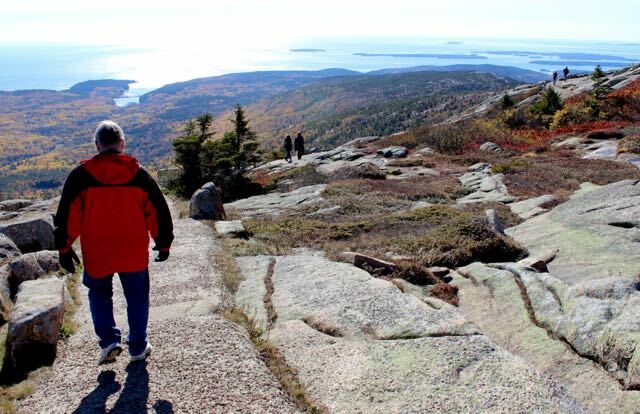 Cadillac Mountain isn’t that high but it is the tallest mountain within 25 miles of the ocean anywhere in the eastern US. 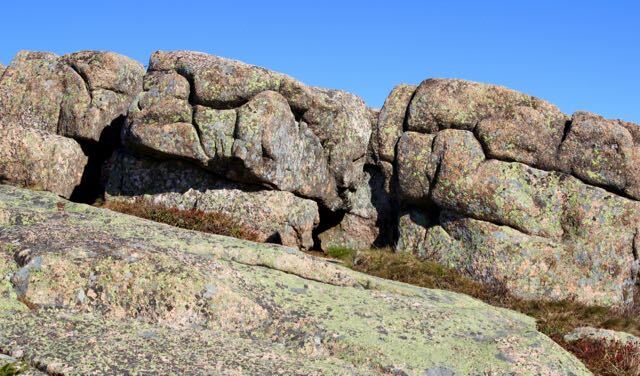 It has a bare peak, with views all around. 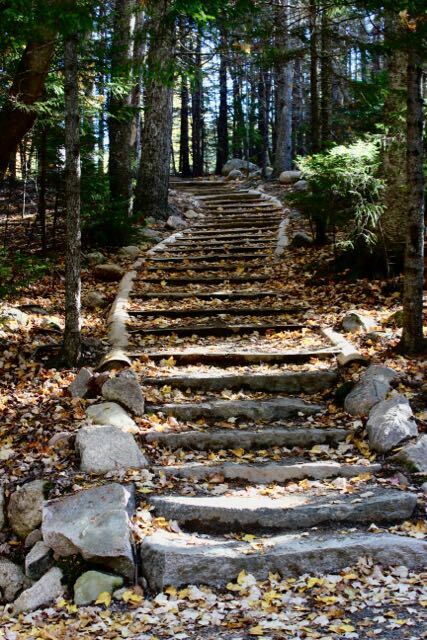 A winding, thrill-inducing road means one can drive up the mountain but a number of trails also allow climbing. 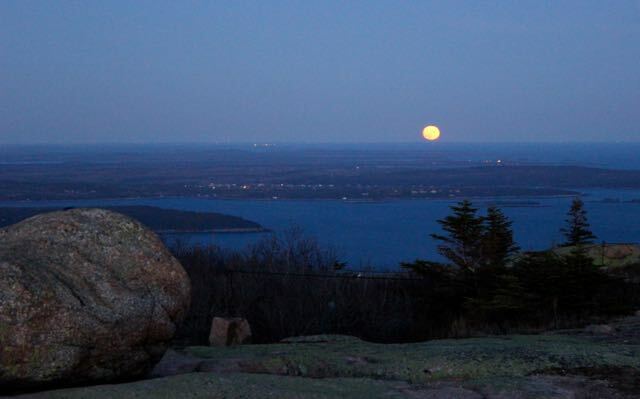 One of Cadillac Mountain’s claims to fame is that it is the first spot in the US to be touched by the rising sun, and every morning throngs of people gather to watch that sunrise. With our good planning, we had every intention of being on the top of Cadillac for the signature moment but . . . planning isn’t everything. More on this in a moment. When it comes to accommodations, my husband and I tend to be seat-of-the-pants travelers, trusting that we can find a place to sleep when we find an area that we like well enough to stay. This time we actually planned a little, though, and found ourselves a cottage to rent right on the ocean’s shore. We watched the tide go in and out, we saw the mist from the cold air drift over the warm water, and, each morning, I watched the full moon set, plop, into the water. That full moon was part of our good fortune. We had no idea! The first night we were in Maine, we drove to the town of Bar Harbor for dinner. 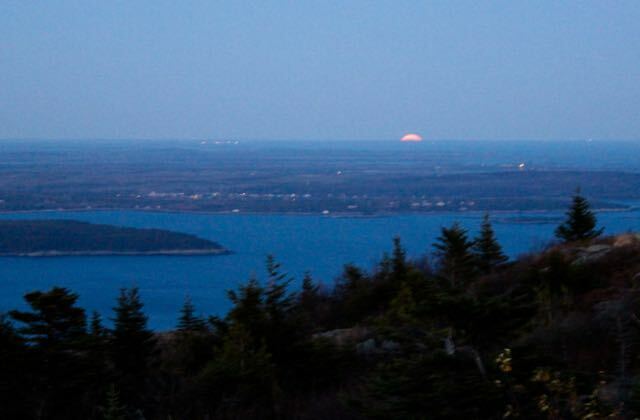 We came over a hill and saw the enormous almost-full moon rising over the ocean. We gasped out loud! 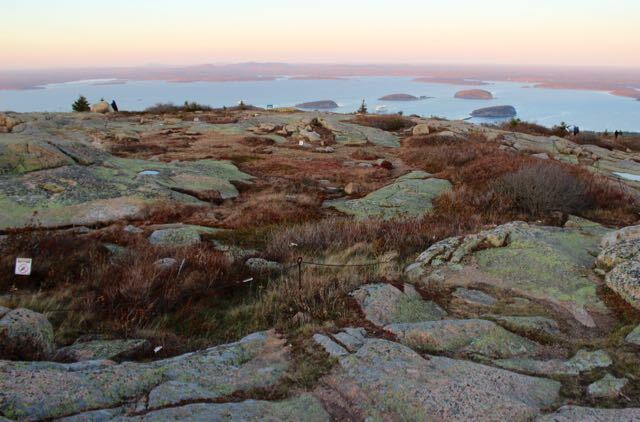 And therein changed our plans for watching sunrise on Cadillac Mountain. The full moon was the next night and, instead of going up for sunrise, we drove that twisty, turny road at dusk to watch the sun set on one side of the mountain. Then we turned our backs on the last bit of light from the sun, to see the pink cuticle of the moon beginning to rise on the other. Beyond the magic of a full moon over the sea at twilight, we were lucky in other ways. We liked that the touristy town of Bar Harbor was less overrun with people than it is most of the year but it hadn’t occurred to us that this would also mean that most of the restaurants we had targeted wouldn’t be open. MUCH of the area simply closes for the winter! So, we counted ourselves lucky that we still managed to eat reasonably well. The best of our luck came as a gift from Mother Nature, though. 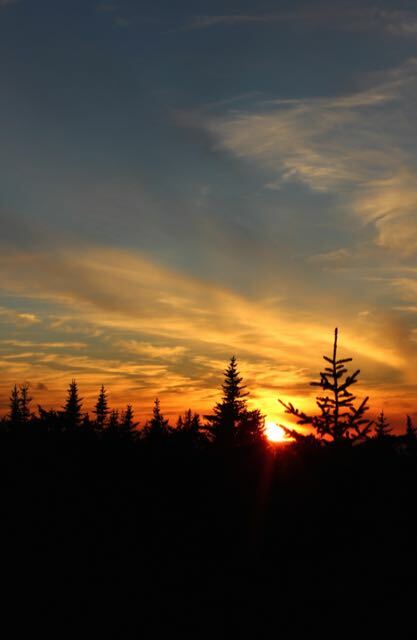 Except for one wicked day, we experienced the best that late autumn could offer. The days started with a crispness that only added to the beauty and drama of the setting and stayed clear and sunny throughout. Many of the trees still had their cloaks of radiant leaves, leaves that glowed against the foil of dark fir trees all around. The ocean and sky burned blue and dazzled. 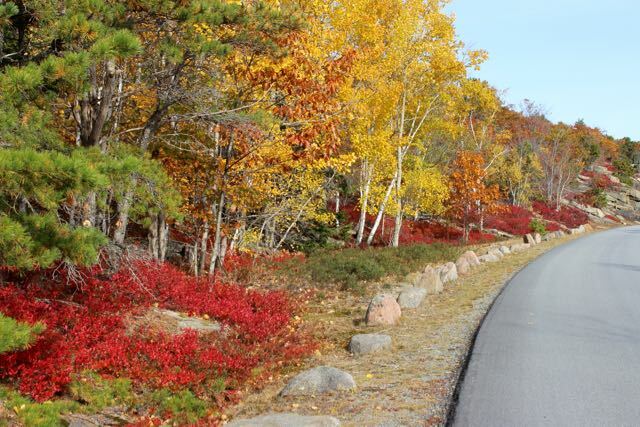 The hot, red foliage of the blueberry bushes contrasted with the cool gray of granite. Big moon, BIG cruise ship! Commonly heard in Maine. . .
My husband offered me this as a birthday gift . 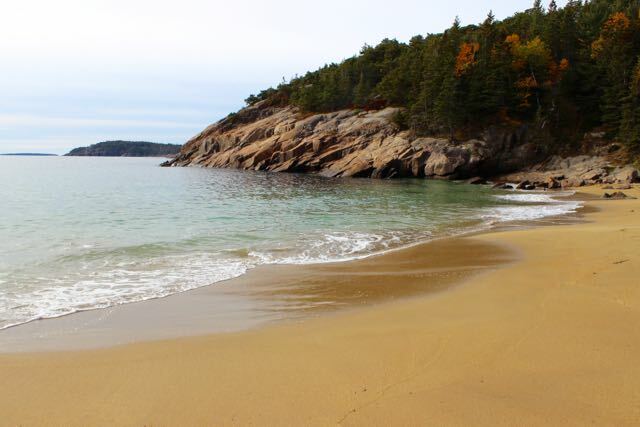 . .
Is there a prettier place than the coast of Maine? I guess you can see, we were pretty pleased with ourselves! We had the good sense to plan to go to a place we could love and the good fortune to find it at its most lovable when we got there!